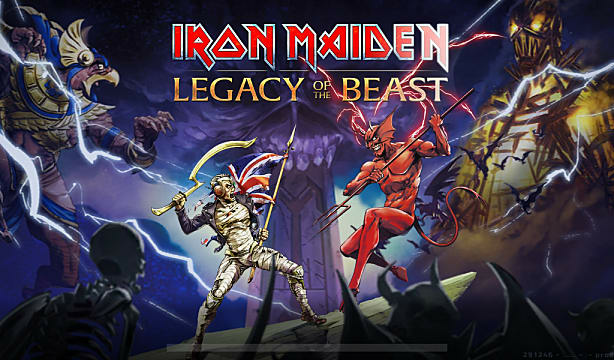 After 40 years of metallic mayhem, Iron Maiden has finally invaded mobile gaming. 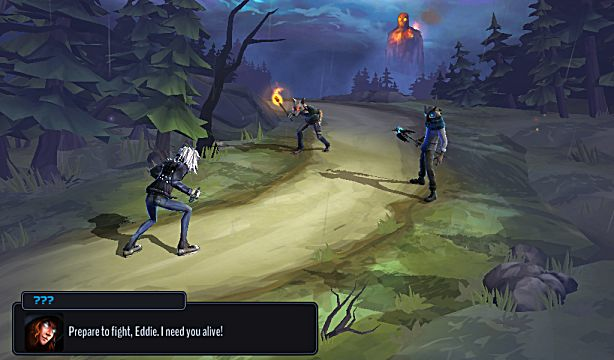 While not the band's actual first video game, this is probably the most polished, even though it is a freemium tap fest RPG. 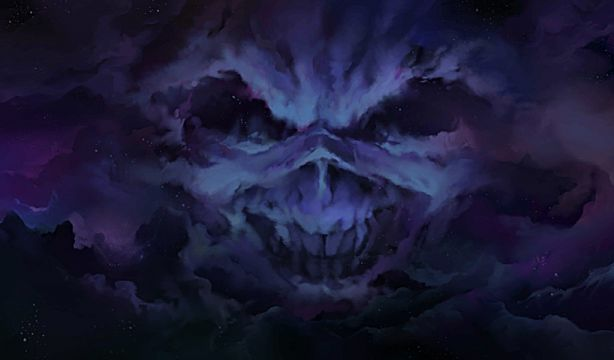 Your first thought upon hearing heavy metal + gaming might be “Brutal Legend on my tablet?” But there's nary a wise cracking Jack Black or a drowned black metal love interest this time around, and no open world or RTS either. 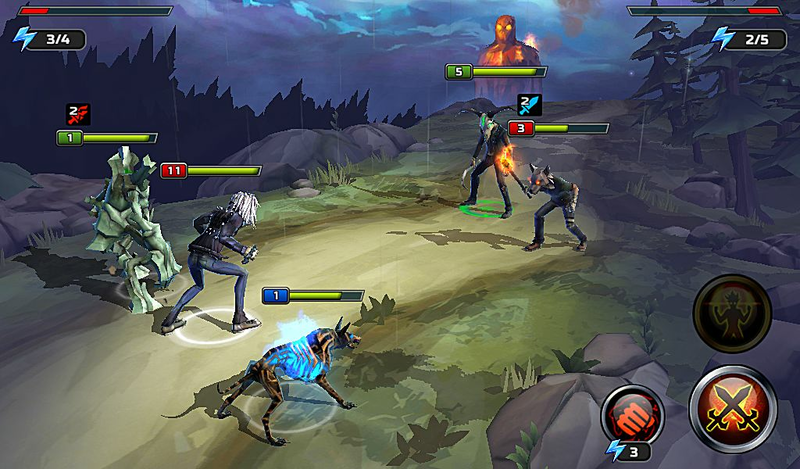 Instead Legacy Of The Beast is essentially a JRPG combined with some light Pokemon style elements. Fans of the band may wonder about the direction, but trust me: it works, especially with every character, ally, and monster based around Maiden cover artwork, tour posters, promo shoots, etc. It actually looks pretty good for a mobile game! Hey, there's a nifty chart! The colored circle underneath a selected enemy automatically calculates the class and level difference for you so you don't have to remember all the combinations. Essentially, green means go, red means think of another tactic unless this is the only enemy left on the screen. It's green Eddie, hit him already! After the first couple of levels you will quickly amass a large group of allies to bring along, so its important to think in terms of pack tactics and how your classes will beat the enemy classes. For instance, there's no point in wasting a strong attack from your first ally to kill a weakened enemy if you have a second ally like the Wickerdog Of Night whose attack hits all enemies at the same time. Although the game's tutorial doesn't explain this, remember you can change the order of your allies' attacks by tapping each one to switch the turn order. In a scenario with one nearly dead enemy and one at full health, switch over to the Wickerdog and have him attack the full health opponent first, since his area attack will still take out the damaged foe anyway. 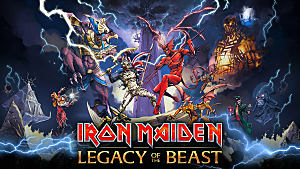 Legacy Of The Beast clearly lists out what enemies you will face in each game area, and you can even tap and hold to see their health, abilities, and so on. Make sure to always take time to check the powers and health levels of the enemies before you start a new level. This lets you plan which allies you should be bringing along to ensure you come out victorious. If you are facing off against tough Warrior opponents, it might be a good idea to take a Magus class like the Possessed Mine that has a 60% chance to stun an enemy with each hit. 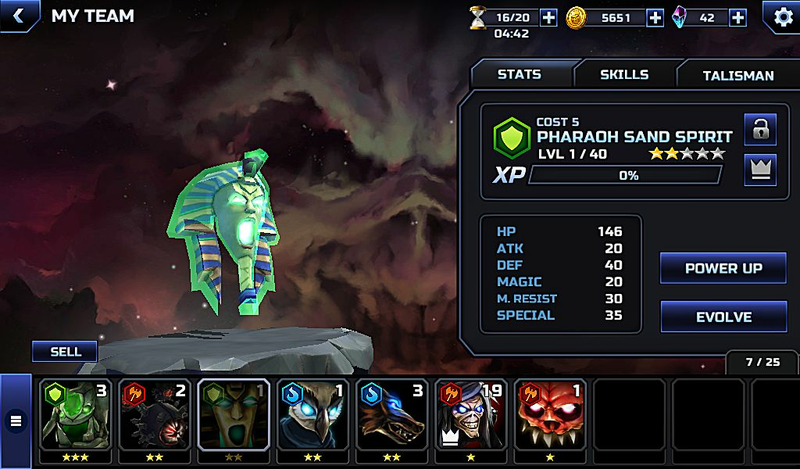 If most of the enemies are Magus class and have magic abilities, take along an ally like the Pharoah Sand Spirit that can silence enemy units. Always check what skills your new allies have! There's an important reason that you should be prepared and never lose a mission beyond the desire to avoid the never ending shame of failure. Starting missions uses up Sands Of Time (Legacy Of The Beast's equivalent of energy), and losing missions costs you even more. If you run out of time, you are entirely locked out of the game until a specific time period passes or you break down and pull out the credit card to buy more time early. 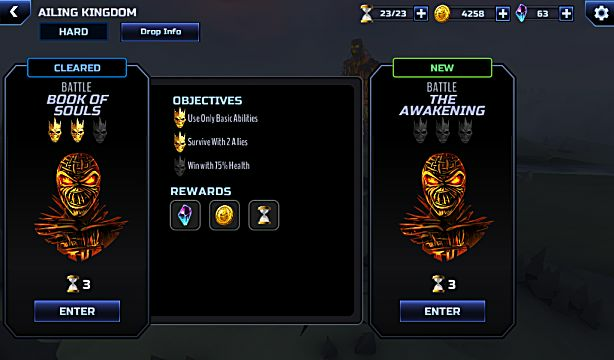 Each level offers between 1 – 3 stars when you complete it with at least one unit alive, with bigger rewards for completing objectives and earning all three stars. Don't forget though that you don't have to meet all the objectives at the same time. 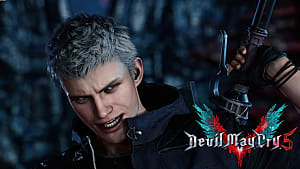 For example, if the objectives are “Use only basic abilities,” “Survive with 2 allies,” and “Win with 75% health” and you get the first two stars on your first playthrough, you don't still have to only use basic abilities and survive with 2 allies intact on your next playthrough. You can simply win with 75% health and the third star will unlock. Some of the more difficult objectives to achieve are the “50% Health” and “75% Health” varieties, especially if you are playing a level for the first time. Obviously bring along a unit capable of healing for these battles, like the Wickerdog Of Night, but more important than having a healer is to time your healing. Initiative is always the same in this game: you and your allies go first, then the enemies go second, so there's no point in healing now if you are just going to immediately get hit again and drop below 75% health. This is doubly important when considering how the game's special abilities work, as there's only a limited pool of points for every character on your team to use for special powers like healing. To ensure you meet the health objective, your best bet is to wait to heal until you know for sure you can fully defeat the enemy on either the current or next turn before getting hit again. After completing the first world you will unlock the ability to swap out main character Eddie with different versions of himself. If your current Eddie incarnation is badly wounded, there's also a devious workaround: swapping to a different Eddie with full health. Absolutely every ally and talisman in the game can be both upgraded and evolved, which significantly increases the replayability and the amount of time you'll be putting into the game. Using items to upgrade your allies and artificially increase their level is of course a viable tactic, but upgrading their talismans usually results in bigger gains on specific attributes, from defense to HP to magic power. 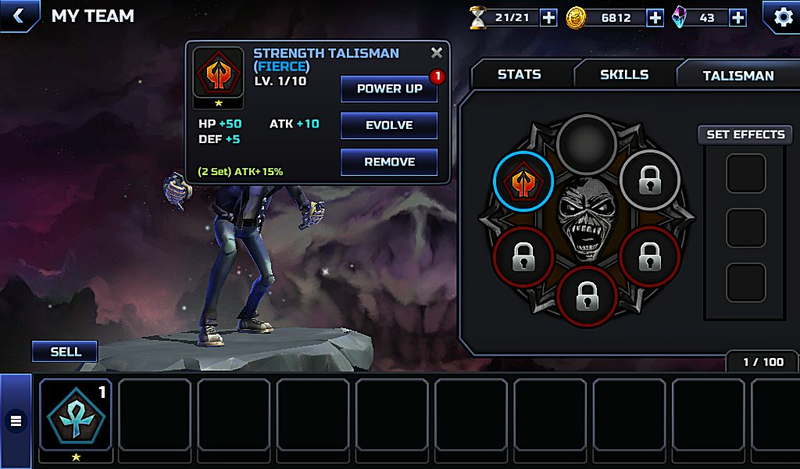 If ever you get the opportunity to increase the Special (SP) stat on either a Talisman or an Eddy, be sure to do it! This lowers the amount of time it takes to fill the Fury meter and use your ultimate attack. More ultimate attacks = much easier and faster levels. 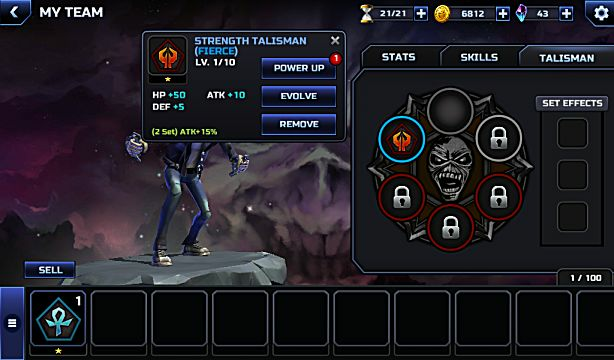 When upgrading your Eddie roster, don't forget that your alternate Eddies in the party lineup still gain experience even if you don't swap to them, so its a good idea to keep your alternate slots full and go beat levels, rather than using up all your items and gold to upgrade them. 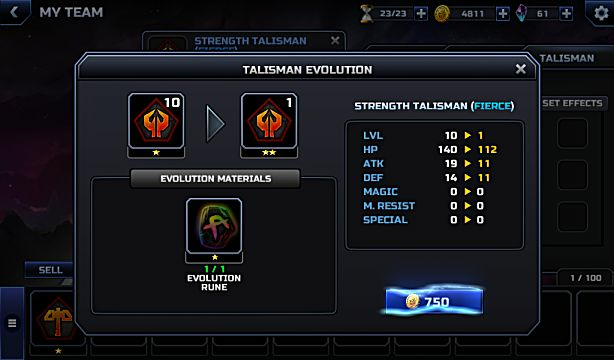 Besides upgrading, each talisman and ally can also be evolved once they hit maximum level. The problem is that they require objects like evolution shards or evolution relics, and you may notice you never find these, even when you get a full 3 stars on a level. These types of items are only granted when you beat a level on Hard or Madness mode, which aren't available until after you complete the Ailing Kingdom section. 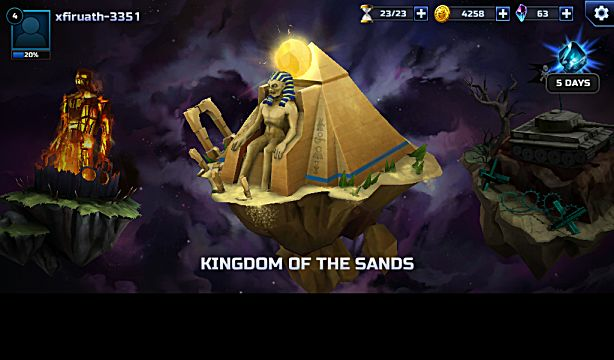 Before moving onto the Kingdom of the Sands, be sure to go back and do several Ailing Kingdom levels on Hard so you can start evolving, which offers a huge boost in later areas. Harder levels give much better loot, but also cost more of the precious Sands Of Time. Instead of 3 time units per level, Hard mode uses 5, while Madness mode uses 10. Obviously you can't do a bunch of those in a row without either waiting real world time or spending some money to bypass the Sands early. All that upgrading comes with some costs, of course. The party lineup you choose for each level has a team cost based on their level and abilities, although the maximum team cost possible goes up as your rank increases. Essentially this is a cap placed so you can't have all the strongest allies and Eddies together rampaging through easy levels, and it also forces you to use other allies and increase their abilities. While upgrading and evolving, keep a careful eye on your gold reserves. You will have a lot of gold at the beginning, but all upgrades cost large quantities of gold in addition to using up looted items. 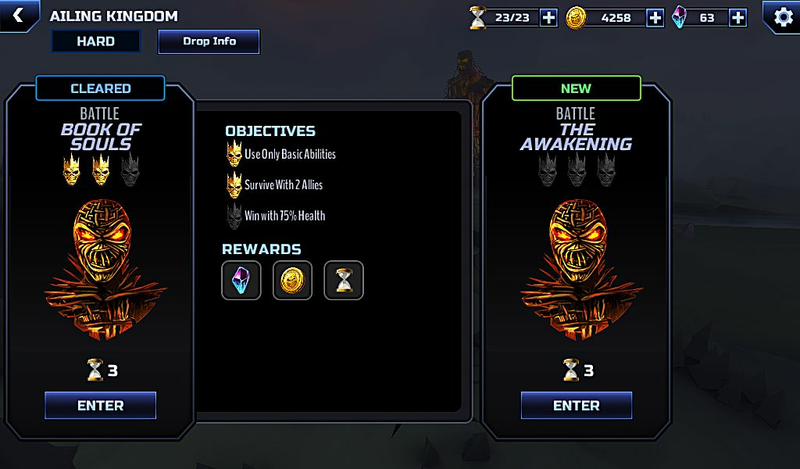 Even using souls to unlock new allies costs gold, so your coffers will dwindle rapidly. If you run out, you can always exchange the precious ironite resource for gold, or sell off unwanted talismans or redundant allies for a boost. Those are all the basic Legacy Of The Beast strategies you need to know to conquer all the worlds and reclaim the shattered remnants of Eddie's soul! Let us know how far you've managed to upgrade your allies and be sure to tell us any tips and tricks you've discovered along the way.